The court heard that the woman had been thrown forward, injuring her face, neck, shoulders and arm. A PASSENGER WAS injured after a man ran onto a roadway in front of a bus to attack a group of Asian people, including a child, the Circuit Civil Court has been told. Judge Terence O’Sullivan heard that the man had thrown a bottle at the Asian group and had then “turned on a sixpence in a millisecond” giving a Dublin Bus driver no chance to avoid hitting him despite having slammed on his brakes. Barrister Susan Lennox told the court that 28-year-old health care worker Rachel Hardiman had been a passenger on the bus and had been thrown forward, injuring her face, neck, shoulders and arm. Lennox, who appeared with Padraig O’Donovan Solicitors for Hardiman, said her client had been sitting downstairs and had been taken by surprise and jolted forward, striking her head and arm against bus furniture. Hardiman said the incident happened while she was on her way to work on 23 September 2012 but instead she had gone home again and laid down for a while. The following day she had felt the consequences of her injuries. Gerard O’Herlihy, of M Roche Solicitors for Dublin Bus, told Judge O’Sullivan that the individual who had run in front of the bus, James Richardson, Williams Place, Clanbrassil Street, Dublin, had been joined to the proceedings as a third party but had not appeared in court despite having been served with the proceedings. O’Herlihy said the bus driver did not have a chance of avoiding Richardson after he had run onto the roadway, taken a bottle from his pocket and thrown it, and then ran back across the roadway. 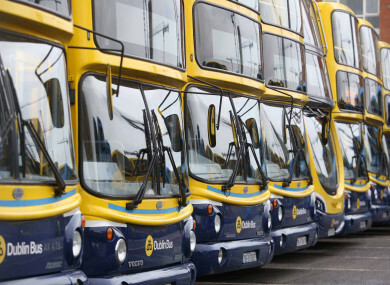 Judge O’Sullivan, awarding Hardiman €25,000 damages and costs against Dublin Bus, said that although the bus driver had lifted his foot off the accelerator after seeing the man on the roadway the court did not consider this to have been enough. The judge felt any prudent driver would have slowed down as drivers could not always expect pedestrians to do precisely what they would do. The bus driver had made an assumption that the pedestrian was going to continue across the road instead of turning back and he had been proved wrong. Judge O’Sullivan said Hardiman had been a very honest plaintiff and, although not very badly injured, still had some problems with her neck. He granted Dublin Bus an order over for €25,000 and costs against the third party, Richardson. Email “€25k award for bus passenger who was injured after driver braked to avoid hitting man”. Feedback on “€25k award for bus passenger who was injured after driver braked to avoid hitting man”.